It is vital to the successful running of a webinar event that your delegates are fully briefed on what to expect to successfully take part in the session. Listed below are our suggestions of the relevant information to include in a pre-session email. Date and time of event. Will all of your participants be in the same time zone as the UK? If not, or if you’re not sure, consider using a service such as timeanddate.com’s Event Time Announcer which will show them the time of the session in their time zone. Confirmation of the delegates booking. Details of any support or contingency plans. If this is your first webinar using Collaborate, we recommend you perform a computer system check to ensure a successful conference. This will include installing the Collaborate Launcher. Please take a look at Preparing your computer for your first Collaborate session. 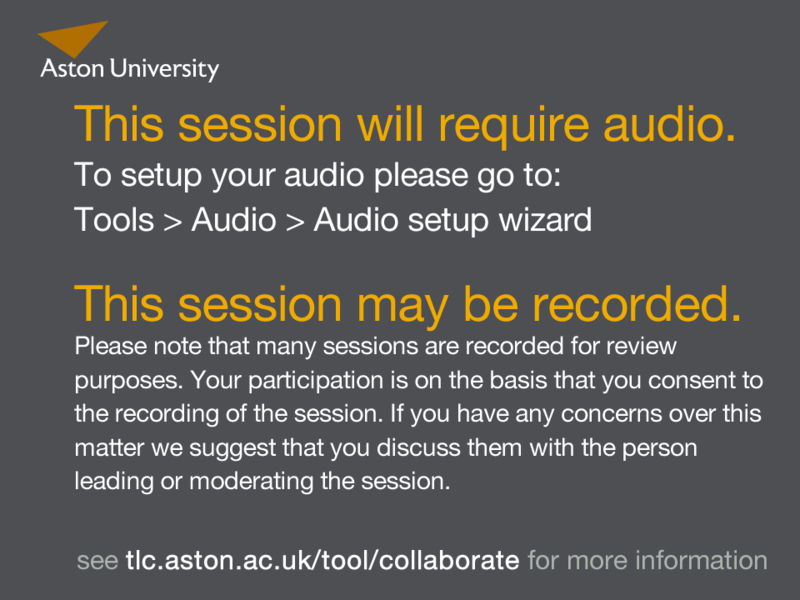 It is advisable to run the audio set up wizard prior to the session as well. To participate in the on-line conference webinars you will need; a computer connected to the internet (broadband connection), a web browser, and PC speakers or headphones (recommended). Enter your full name when prompted to do so. You will be able to connect to each webinar prior to the start time to ensure you are prepared for the session. Webinars may be recorded. By participating in the live webinars, you agree to feature on the archived recording. Each webinar will follow a conventional format with the presenter displaying material on the accompanying whiteboard screen, whilst explaining their work/project. See also attached guide for further instructions. At any time during a webinar you can ask a question or make a comment in the text chat window. This image is intended to be used as the first slide that a participant sees when entering a session. It gives them some basic information regarding set up of their audio and reminds them that they are likely to be recorded during the session.